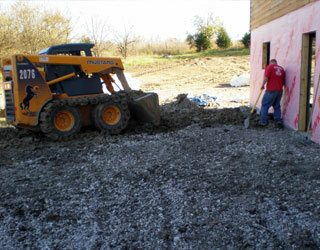 At Dirt Works we are skilled in any kind of Bobcat Work you need here in the Kansas City area. If you need Bobcat Work in Kansas City then Dirt Works is who you need to contact. We have experience with all kinds of Bobcat Work. 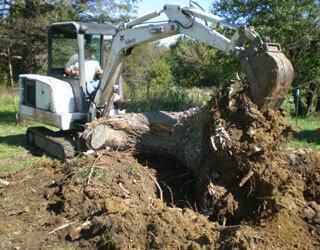 From landscaping, to grading, to large tree stump removal, we've done it all here at Dirt Works. With the amount of water that runsoff during our rainstorms and springs here in the Kansas City area, detention ponds and retention ponds are a very popular addition to many home lots. We can dig and burm up your ponds and lagoons where you want them and how you want them to look to add to the landscape design of your yard. If you need ditches, just show us where to put them and we'll take care of making sure we do not hit utilities to put your drainage systems in place. Are you looking to install a driveway, yard, or something else that you need flat landscaping for? We can install concrete or gravel driveways, grade existing gravel driveways and haul in new gravel, and flatten out your yard for grass installation. 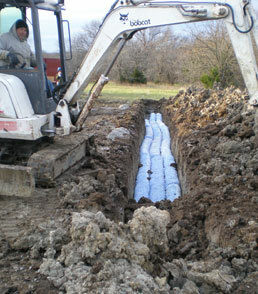 We have experience with all kinds of trenching. Whether you are looking to install a new culvert or looking to have a trench dug for foundation footings, give us a call. We also trench for water main, sewer mains, and under ground power lines. Do you have dirt or gravel that you need hauled in to or away from your property? 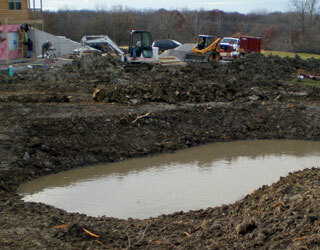 We have access to dump trucks, gravel, and top soil that we can have hauled in to your property to do grading work on. If you want dirt or concrete hauled away, just let us know what it is and we'll schedule a time to haul it away for you. Call Dirt Works today for your Bobcat work in Kansas City. If dirt needs to move, we know how to work it.